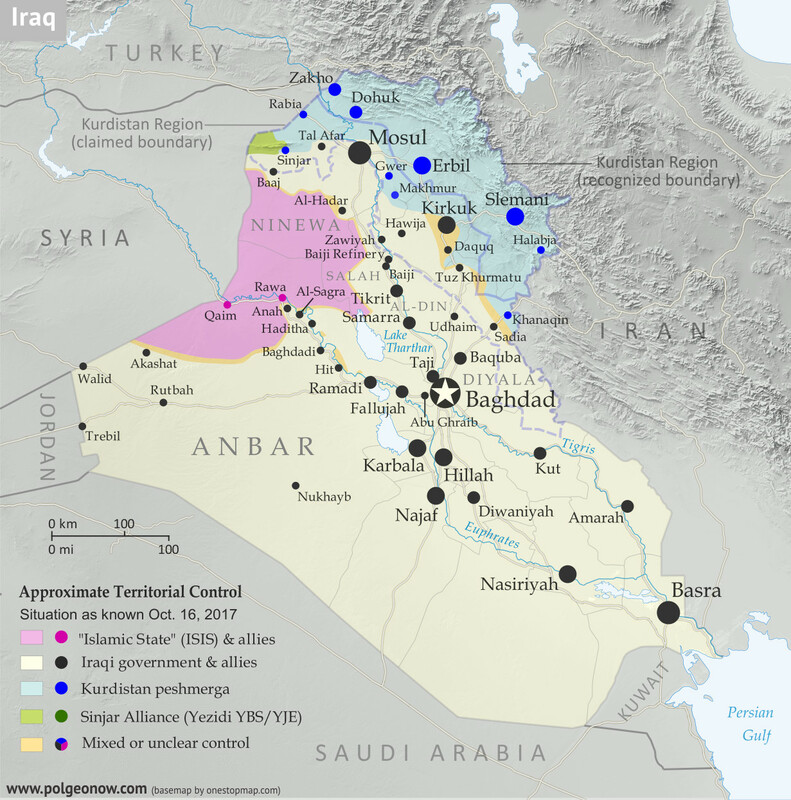 In addition to the elimination of the fully-surrounded IS enclaves in Tal Afar and Hawija, the government recapture of those two areas also means that, for the first time since at least 2014, Iraqi Kurdistan doesn't share any "borders" with IS territory. The following is an outline of territorial control changes and other major events since PolGeoNow's previous Iraq map update of July 30, 2017. The abbreviation "IS" refers to the organization calling itself the "Islamic State", also known as ISIS or ISIL. The Peshmerga are the military forces of self-governed Iraqi Kurdistan. The pro-government Iraqi Shiite militia known as the Popular Mobilization Units (PMU) was attacked by IS close to the border with Syria in the Akashat area. Between 40 and 68 Shiite militiamen were killed in the attack. The militia accused the US-led coalition of hitting its positions with artillery bombardment from across the border. The coalition denied this. The Iraqi military began conducting airstrikes against IS positions in the Tal Afar area, one of two remaining IS-controlled enclaves bordering Kurdistan Peshmerga territory, in preparation for a ground assault. A Kurdish delegation to Baghdad refused to postpone Iraqi Kurdistan's independence referendum, planned for September 25, as it met with Iraq’s Prime Minister and the embassies of the United States, Iran, and Turkey. The next day, the Turkish Foreign Minister and a presidential spokesman voiced strong opposition to the planned referendum, with the minister warning that the move could lead to civil war. On August 17, the Kurdish delegation said Kurdistan could delay the vote on independence “for a short time” if the Iraqi government, under an internationally-backed framework, promised to set another date for the referendum. Later, a senior Kurdish official said the region would consider the possibility of a postponement in return for financial and political concessions from the Iraqi government. The Iraqi military launched a ground offensive against IS-held Tal Afar, capturing several villages east, southwest, and northwest of the town. Overall, 10 villages were reported seized by a combination of Iraqi Army, police, and PMU units on the first day of the offensive. On August 22, Iraqi forces breached Tal Afar’s city limits from the south and east, capturing three neighborhoods and more than 70 percent of a fourth one by the next day. By this time, government forces had also taken control of 15 villages around the town. Iraqi forces reached Tal Afar’s city center. Iraqi government troops captured Tal Afar, with IS fighters pushed out to a small town 11 kilometers northwest of the city, where they were making their last stand. Fighting in the town near Tal Afar was reported to be "multiple times worse" than the battle for Mosul, as Iraqi forces faced fierce IS resistance in house-by-house fighting. The next day, the Iraqi Prime Minister declared victory over IS in Tal Afar and the whole of Ninewa (Nineveh) province, although pockets of IS resistance remained in the town. Overall, 115 Iraqi soldiers were killed and 679 wounded during the Tal Afar offensive, while Iraq claimed 2,000 IS fighters were killed. In contrast, the US reported only 1,000 to 1,200 IS fighters killed. Some 84 people were killed and 93 wounded, including at least seven Iranian pilgrims, in a double IS attack on a restaurant and a security checkpoint near Nasiriyah in Iraq's south. The three or four attackers, who were all also killed, were reportedly dressed as pro-government Shiite militiamen. The Iraqi military launched an operation against IS in the Akashat area, near the southern part of the Syrian border. Soon afterwards, the region was secured. The Iraqi military launched an operation towards IS-held Anah in Anbar province. Two days later, security forces captured Anah. The Iraqi Army attacked the Hawija pocket of IS territory, the last remaining IS enclave bordering Kurdish-held territory, capturing 11 villages. Iraqi forces captured two more villages in the Hawija district, including Zawiyah. The next day, the first phase of the Hawija offensive was declared concluded. Iraqi Kurdistan voted in a controversial referendum on independence from Iraq. The results were announced two days later, with 92.7% voting in favor of independence. Some 72% percent of the Kurdish region’s 8.4 million strong population voted. The region's government did not immediately declare independence, promising instead to begin negotiations with Iraq's central government in Baghdad. In response to the vote, Baghdad threatened to close Kurdish airspace, while Turkey was considering shutting down its border with the region and imposing a trade ban. The Iraqi Prime Minister appeared to rule out military action, even though some Iraqi leaders warned of this, particularly in regards to Kirkuk, and Iraq’s parliament approved the use of force as part of a resolution condemning the referendum. Kurdistan Referendum Coverage: For more information, check out PolGeoNow's article on the results and consequences of the Kurdistan referendum, and follow us on Twitter for news on how the situation is continuing to play out. Iraqi security forces launched the second phase of their offensive in the Hawija area, quickly capturing 70 square kilometers of territory west of Hawija town. By October 2, 45 villages were captured, and on the same day, Iraqi security forces seized another five villages and an airbase in a new assault. More areas were captured on October 3. The final assault on Hawija was launched, with Iraqi security forces entering the town’s outskirts. The next day, Iraqi troops captured Hawija, though fighting continued in a pocket of IS territory north and east of the town. 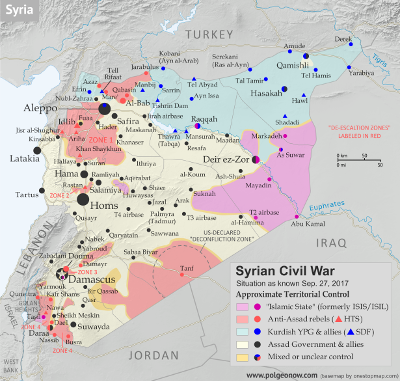 It was reported that over the previous three or four days, 1,000 IS fighters had surrendered in the area. On October 6, Iraqi security forces cleared the whole Hawija district of IS and linked up with nearby Kurdish Peshmerga forces after capturing the last 20 villages in the area. Thousands of Kurdish Peshmerga troops were sent to reinforce the Kurdish-held city of Kirkuk, amid a standoff with Iraqi troops over Kurdistan's controversial independence referendum. Kirkuk is a territory long disputed between the Kurdistan region and Iraq's central government. 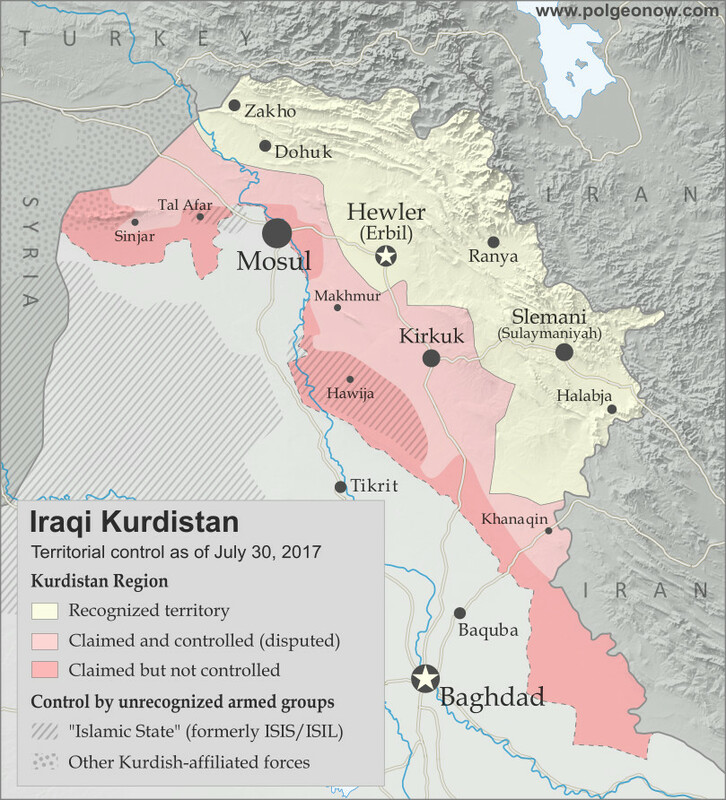 Kurdistan took control of the city after it got cut off from from the rest of Iraq during the IS takeover of 2014. The rise in tensions came after Iraqi forces took several positions near Kirkuk, including a base west of the city that had been abandoned by Kurdish fighters. An unnamed Iraqi general stated they were advancing to retake positions that were captured by the Kurds in June 2014. By nightfall, fears of an imminent battle for Kirkuk dissipated. Iraqi government forces launched an operation to capture the province of Kirkuk and its capital from Kurdish Peshmerga forces. Government troops quickly captured several positions south of the city, including Kirkuk’s industrial district, two major oil fields and a military airbase near the city. A Peshmerga spokesman claimed Iraqi troops “burnt houses and killed many” in an assault on the Daquq and Tuz Khurmatu areas south of the city. Two people were confirmed killed during the day in artillery shelling in Tuz Khurmatu. Later in the day, Iraqi security forces entered and seized Kirkuk city with little resistance after a surprise withdrawal by the Peshmerga. Tens of thousands of civilians also fled the city towards Kurdish-held areas. Meanwhile, two Turkish soldiers were killed by an improvised explosive device elsewhere in northern Iraq. The Turkish military maintains a presence in western Peshmerga territory as part of efforts to combat IS, generally with the consent of Kurdistan's government but against the will of Baghdad. Turkish forces also sometimes launch strikes on Kurdish rebels from Turkey who take shelter on the Iraqi side of the border.